Comic Books! Comic Strips! Comic Reviews! Self-Publishing! Fan-Fiction! Industry News! Discussion about our favorite topic: Comics, and so much more! 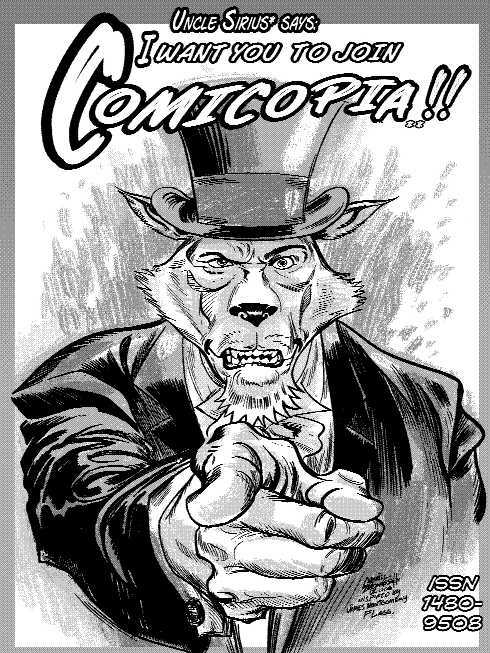 The entire Comicopia Website is in a state of Revamp. Please bear with me while I get all the links updated. If you find a broken link, please drop me a line. Thanks! now online featuring artwork by Gabriel Morrissette, Jay Willson, Daniel Robert, Tom Davidson, Alan J. Porter, Chuck Rhodes, Francisco M. Rosa. now online featuring artwork by Gabriel Morrissette, Chuck Rhodes, Alan J. Porter, Jay Willson, Francisco M. Rosa, Daniel Robert, Tom Davidson. now online featuring artwork by Gabriel Morrissette, Chuck Rhodes, Alan J. Porter, Jay Willson, Francisco M. Rosa, Daniel Robert, Tom Davidson and Guests. now online featuring artwork by Gabriel Morrissette, Chuck Rhodes, Alan J. Porter, Jay Willson, Francisco M. Rosa, Daniel Robert, Johane Matte, and Guests. To see earlier covers, please use the Navigation links and view by All Covers or by Members.